This homemade costume for pets entered our 2018 Halloween Costume Contest. 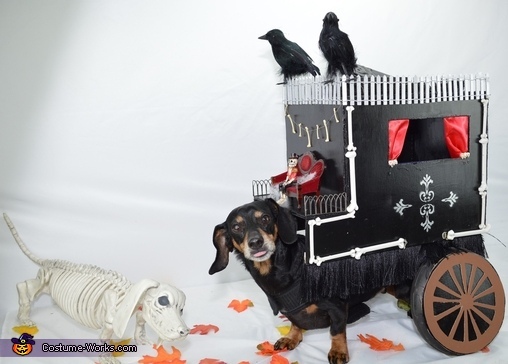 Oscar our 8 year old mini dachshund is driving the funeral carriage. We try to pick costumes that will work well with his wheelchair. We made the carriage out of wood, cut windows out and put lights inside. Then it was all about finding the perfect decorations from the skeleton driver to the coffin and black moss on top of the carriage.